Those planning a vacation to the Caribbean might be overwhelmed by the thought of packing. While a trip to a tropical destination is exciting, if you have never been, you probably aren’t sure what to bring with you. 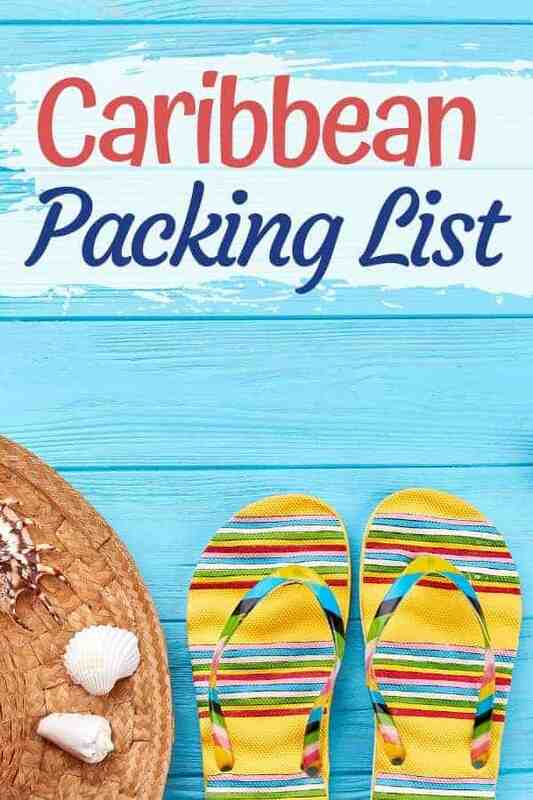 We have vacationed in the Caribbean quite a bit and believe we have come up with a great Caribbean packing list. The key to packing for tropical vacation is knowing how to pack efficiently by making sure you have what you need instead of what you might need. Over-packing is the worst. Not only will you end up paying more for luggage that is heavy, you may find that you are less organized with way too many items crammed in your bags. One way to make sure that you items stay neat and organized in your luggage is to use packing cubes. These will allow you to find what you need without having to tear up your entire suitcase. Read more about our International Travel essentials. The right Caribbean clothing will be essential in your comfort while on vacation. It is an average of 80˚F in most Caribbean locations and humid nearly year round which means you will feel sticky if you aren’t wearing the right things. You will be in the tropics, so dress appropriately. Bring shorts, tops, sundresses and of course swimsuits. Find items that can be worn multiple ways, like a sundress that can also be used as a beach cover up. Choose fabrics that are breathable and clothing that doesn’t stick to your body. Find out if your resort has laundry services on site. If so, be sure to pack a few Tide pods so that you can do some wash.
After a day in the sun, your body may react by making you feel cooler in the evening. Bring a lightweight jacket or cardigan sweater. Hats & sunglasses are essential items to pack when you will be out in the sun day after day. Choose a wide brim hat to protect your face (and one that collapses to make it easy to pack) and sunglasses with UVB & UVA protection. Walking Shoes are one of the most difficult items to pack because they weigh so much. Try to wear your sneakers on the plane and then pack the other shoes you will need for your Caribbean vacation in your luggage. When packing for the Caribbean, bring a pair of flip flops, sandals and a dressier shoe if you plan on dining at a fancy restaurant. Bring a Lightweight Bag. This is not the time or place to bring your normal leather Coach bag. 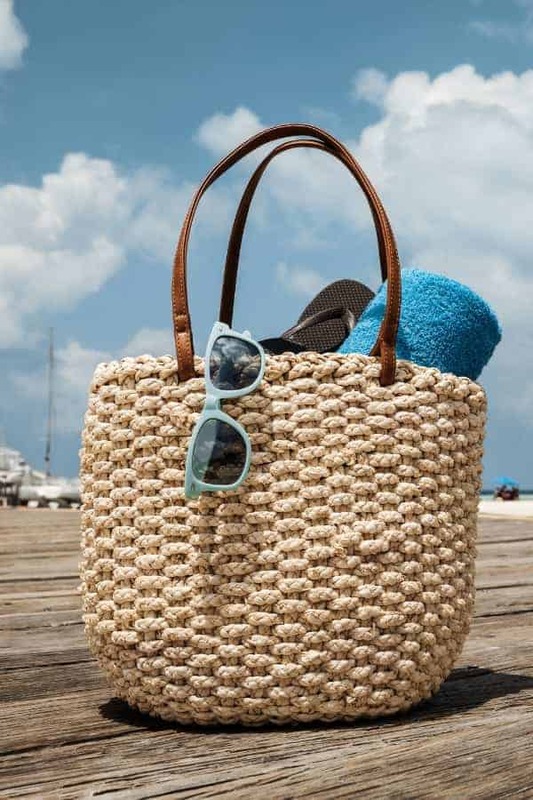 Leave it at home and opt for a neutral, light weight bag that can double as a beach tote! If you need a fancier bag for an evening out, opt for a small clutch that will also fit your phone. The #1 must have item on our Caribbean packing list is sunscreen. Bring a high level SPF sunscreen that is waterproof. We always carry a sunscreen stick in our day bag to touch up our face, ears, shoulders and back of neck that tends to get the most sun exposure throughout the day. Insect repellent wipes are something you will be so glad to have in the Caribbean. When you are out & about in the tropics, you are going to encounter bugs. Bugs like mosquitoes can carry harmful diseases, and you will want to do what you can to avoid getting bit. While you could bring a pump spray bottle, we prefer bug wipes (like these from Avon’s Skin So Soft line). They are perfect size to carry in your day bag and you don’t have to worry about it spilling on your items in you luggage. Waterproof Phone cases are one of my favorite things to pack for a Caribbean trip. When you are at the beach and worried about leaving your phone, credit cards or cash when you take a dip in the ocean, take it with you in one of these waterproof phone cases! Plan on doing some sightseeing in the Caribbean? If you are going to be doing a lot of walking or sightseeing, pack one of these Cooling towels in your day bag. Simply wet with a little water and it turns icy cold and will help cool you off immediately! They also dry quickly so that you can pack them away when you are done and reuse when you need. One thing that I take with me on every vacation is my Kindle Fire. I read on it, I watch movies on it and can even take photos with it! It is so lightweight and easy to travel with, that it goes with me everywhere. A trip to the Caribbean is a wonderful way to spend your vacation. We hope that this Caribbean packing list helps you see that you won’t need to pack a ton of items for your trip, just the things you’ll need!